Thurs. Sept 27, 2012……What a nice morning, I would not be unhappy if we had a whole lot of the weather we have had lately. Looks like the next couple days we have some rain on the way, just in time for the opening of all Delayed Harvest waters . DH waters will be stocked beginning Monday, Oct.1 and stocking will be done all week and should be complete by Oct. 6,7 dates. Anyone needing specific info on the exact stocking date for a particular stream can contact me and I will pass along that info. 4 new waters have been added to the DH program, and we know them all. We had a challenging smallmouth trip yesterday, the fish were not on as they have been. I guided Dan Camia and Larry Tomar and we landed about a dozen fish, give or take a few. 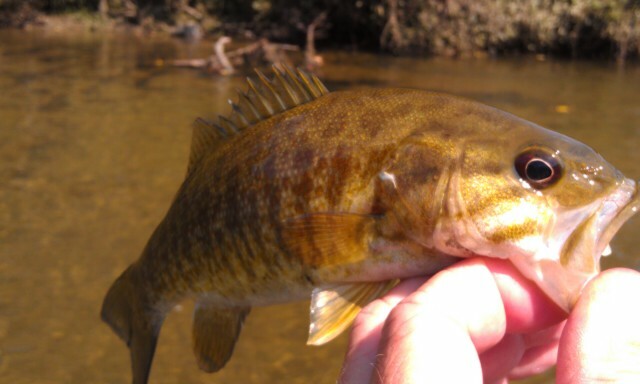 We caught a mix of smallmouth, redeyes, redbreast, and even a few stonerollers. But it was tough and the topwater bite on the NC forks of the New has all but stopped with cooling temps. Water temps have gone from 62-64F in the am to 54F …..quite a change. It was all streamers fishing for us….and slow retrieves. Have some upcoming trips annd will have some good fishing reports as well. Have a great one today. Wed. Sept. 26, 2012…..Nice morning and it was cool to start, but it quickly warmed into the 60s. 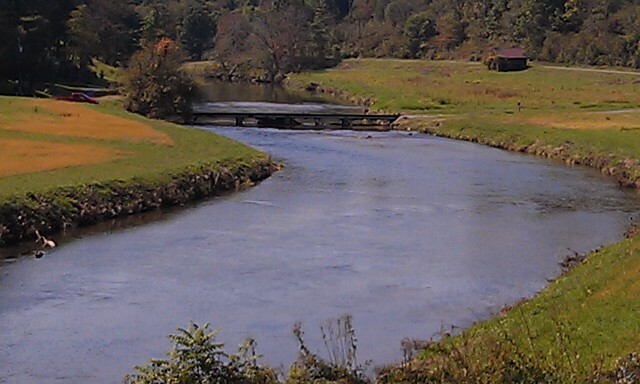 Cold nightly temps the past week have brought water temps down on the South Fork New where we were from 64F to 54F. Pretty cool, especially for September. Guided Larry Tomar and Dan Camia, both of Greensboro, NC, and we were fishing for smallmouth and a mixed bag so to speak. Fishing was slow and pretty tough. More than I expected in that way, we did land about a dozen to 15 fish, a mix of smallmouth, redeyes, and a couple stonerollers. 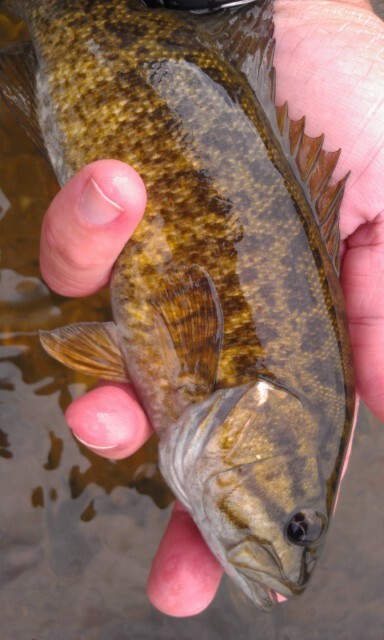 We had one large smallmouth swirl on a popper when we first got in….it left about a 3ft circle on the surface. It was in a place where a couple of 3lb plus , 18-20" bass live. We fished just a half day, and at 230pm headed back. I have a GTCC Flyfishing 101 class tonight at 630pm, and its our final session before our class culminates on Saturday Oct 6,.2012 with a group trip. Wed. Sept. 26, 2012….What a nice morning it is, an early start as it is most mornings for me. Good thing I don’t like sleeping late or sleeping in…..I would be in trouble in this line of work. Most mornings we wake the roosters up…lol. Headed off this morning to the mountains…guiding Larry Tomar and Dan Camia and we are after smallmouth. After the trip I have the final session of our GTCC Beginning Fly Fishing Class….a long day for sure. But a good one….! 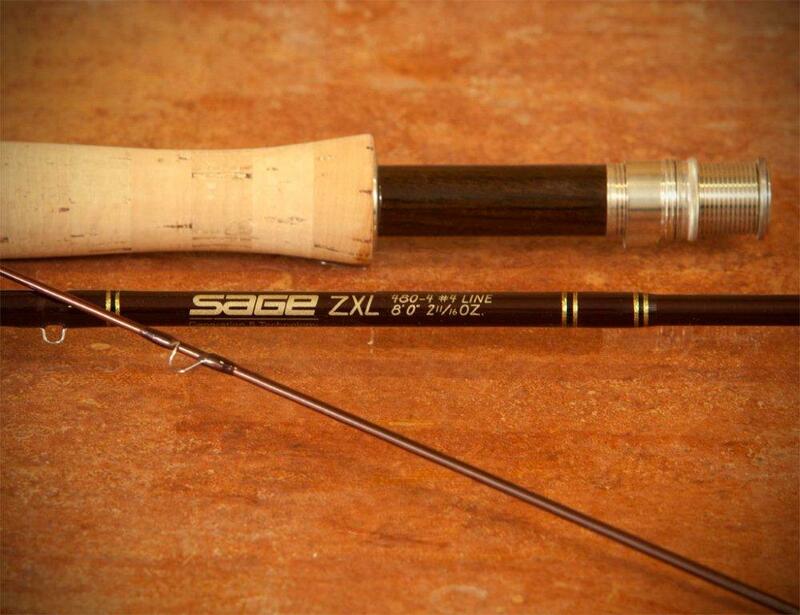 Sage ZXL Rods Being Closed Out…. Mon. Sept. 22, 2012……You know it was going to happen eventually, as it usually does with any rod series no matter who makes it. Such is the case with the Sage ZXL. For those who know me or have fished with me or taken a guided trip know my affinity for Sage rods. 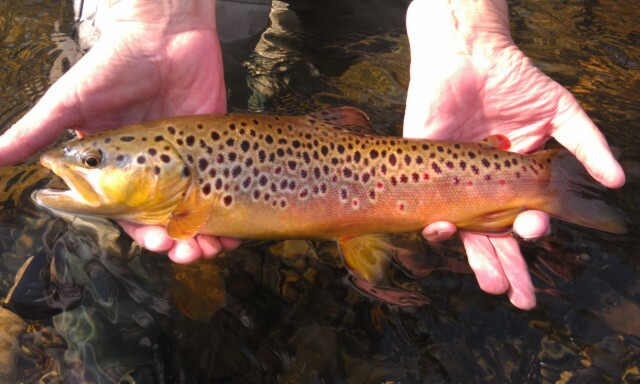 The ZXL, along with the Classic LL, are the finest trout sticks I have yet wielded on a trout stream. The near perfect meld and balance between power and delicacy, and smoothness with protecting light tippets on the hookset and when playing a fish make these rods really incredible fishing tools. My favorite is the 4 weight, my 9ft 4 weight rod is perhaps my favorite trout stick. It has nailed many a TN and VA tailwater fish, many fish on our delayed harvest waters….simply put it is a gem when it comes to a trout rod. Landed one of my best fish of all of last year on this rod, a 25.5 inch South Holston brown….a fish that ate a size 18 sulphur dry and then gave this rod quite a battle. But it handled the situation perfectly. I and many of my clients have landed rainbows up to 28-29″ long on it…..the large fish on the private waters I take clients too. Sage is currently closing out these rods and there are some incredible sales going on. I normally don’t post stuff like this but I know I get a lot of questions and comments on what rods I like for fishing our waters here. The 8’6″ and 9’0′ 4 weight rods are my favorites. So, I found a couple of folks that are running some pretty good deals on them. Two of the best are below. Cabela’s is one, Stillwater fly shop is another. Cabela’s is $509 (retail $685) and Stillwater is selling them for $411 to $414. That is quite a deal! Below are the links to the rods in case you are interested in buying one…. 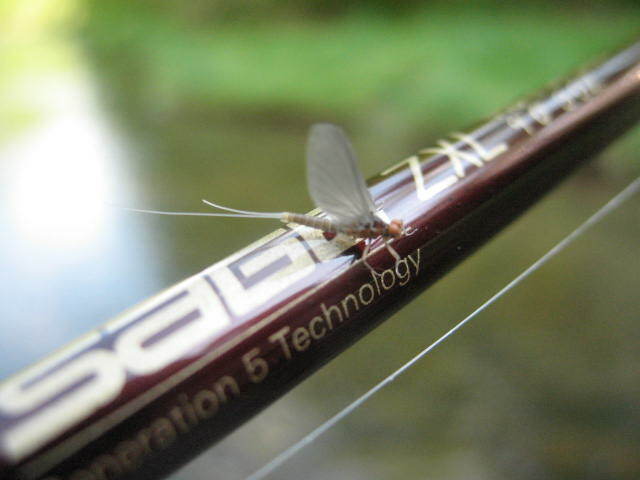 Anyway, if you are looking for a great fly rod….these are truly great ones! Good luck! Mon. Sept. 24, 2012….Great start to a new week, can you believe this incredible weather? Feels like the typical summer weather out west. Just a recap of Saturday’s trip, we’ve had some phenomenal ones lately….I guided David and his son in law John and we had a fantastic day , first day of Fall on the South Holston, it was phenomenal for 2 days in a row. The cooler temps mean the bugs are more active and the fish are eating like crazy. We were in the water bright and early (7am), and my plan was to take the guys to one of my favorite midge flats since the fishing with midges in the early am hours had been so effective. Good move, because over the next 4 hours landed 35-40 fish and two 20″ browns. Caught them on midges early and also on blue winged olives. Have a few new patterns that are working great. The Fall weather today was nice except for an advancing cold front that was supposed to rise late in the day instead showed up about 11am and it gave us incredibly high winds….blustery. Very much like spring, there were times the wind would gust to 30mph or more, which is tough when you are fishing 12ft plusWe fished a couple places ahead of the 430pm water rise and did well there also. John landed a 20 inch brown as we fished some water near Bluff City and David landed a nice 18-19″ fish right after and as the water was coming up. David fought the fish and I netted it and the walk out was interesting…..with the water about half way up ….if we’d waited any longer we’d have been swimming. 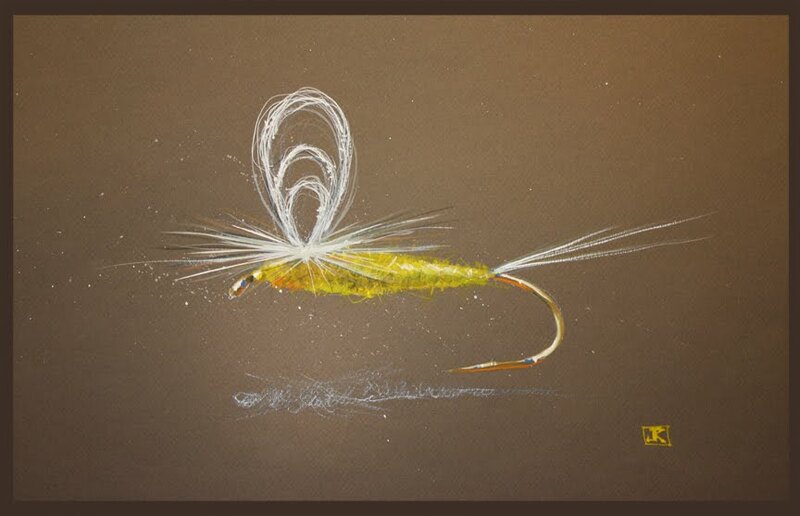 The largest fish of the day took one of my CDC caddis indicator flies- – -the fly I use a lot when fishing dry /dropper rigs….that makes two large fish this week that have taken that fly. One a large brown and the other a big rainbow. The water came up on us at another spot so we ventured upstream and fished a couple of spots with the water high. We only saw a couple of risers so we poked around some islands and then drove down to below the weir and the waterworks dam. I knew there we’d have some action given it was end of the day and we’d have falling water at 7pm when the TVA was scheduled to cut off. That is exactly what happened and it was a good call. Within minutes of the water falling we had a ton of risers, many of them scarfing up the tons of midge spinners coming down. We landed about 6 or 8 more fish, one of them a 22″ rainbow by John on one of my new chocolate midge patterns. John landed it on a #22 midge and 6X, which is pretty good by any standard. It was a great day, the guys were great as always, and it turned out to be a phenomenal day despite the windy conditions that persisted from 11am on til the end of the day. 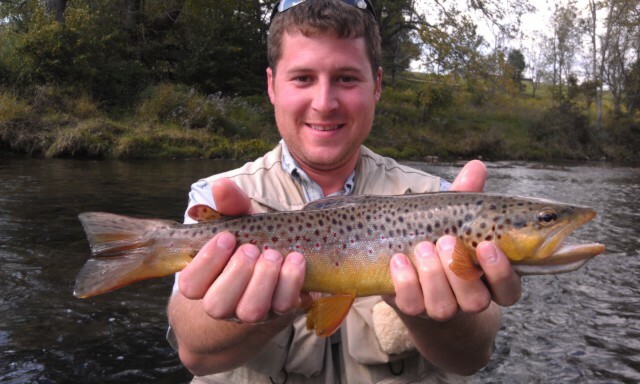 Its going to be a great fall on the South Holston, its already off to a phenomenal season….and we’re catching some big fish as well. Here are a few pics, you can view the Entire Trip Photo Album here . 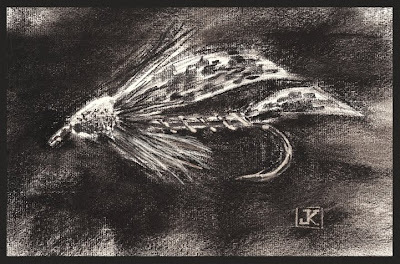 The theme continues….tiny flies….lots of fish….and some big fish. 4 20″ fish last week…….pretty sweet. A good weather week coming up, looks like lots of sun and comfortable temperatures. Its going to be a great fall season, we have good conditions and that should remain the case if we continue to stay cool and get rains regularly. Our Fall calendar is shaping up to be a full and busy one, we have 8 openings left for October and several in November, as well as a host of dates in December. What we’ve tried to do for the last decade is really get the word out how much fun and how productive fishing can be in cool /cold weather. Cold weather fishing isn’t an ‘off’ season thing, far from it. Its our busiest time….and for good reason. About 90% of our fish over 20inches are caught in cold weather……between November and late March….so its hardly time that we put the gear away and ‘wait for spring when its nice’. If you are interested in catching larger fish, you need to be fishing during cold weather……no kidding! Have a great one and good fishing…. Another Great Day on the SoHo….. Sat. Sept. 22, 2012….Another fantastic day on the SoHo, guiding Dr David Spivey and his son in law John, we have landed 35-40 fish and two 20" browns. Caught them on midges early and also on blue winged olives. The largest fish of the day took one of my CDC caddis indicator flies….that makes two large fish this week that have taken that fly. We are off to another spot…..more to come…. Sat. Sept. 22, 2012….Just getting ready to get into the river, nice morning and its cloudy…..I like it. Guiding Dr David Spivey and his son in law John. We are on the South Holston and hoping for a super day on this first day of Fall. Fall Is In the Air….. Sat. Sept. 22, 2012….And as it should be. I love it when the mornings are cool…..its 52F here in Damascus, VA…..and you can see your breath. But by 10 or 10:30am that jacket or fleece is coming off and you take a deep breath …..all the while reminding yourself what a great day it is to be outside. It’s been like this a lot lately, and I must say its kind of like being out West…..Wyomingish…..and maybe that. Is one reason I love it so much. Yesterday’s trip was just like that….except add in excellent fishing. 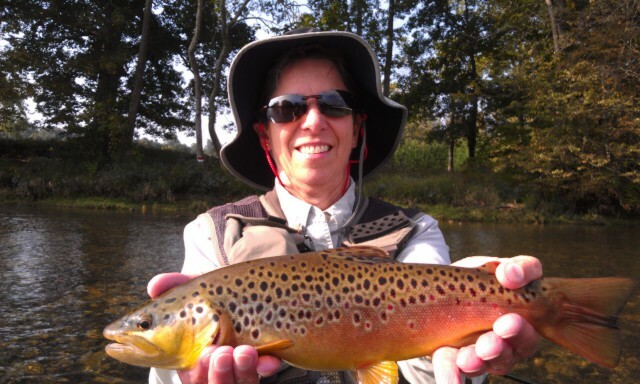 I guided Laura Kennerly of Madison, NC on East Tennessee’s South Holston, and it was a great day. There are good days and great ones…..this was a great one. The fish were on their usual missions….depleting the midge population by eating tons of them. We did really well, scoring 25-30 fish on some of my new midge patterns. Two 20" fish and two others in the 17"-19" class. It was great, we fished until about 1130 am or so, then moved downstream and hit another spot and there we nailed another large 18-19" rainbow, one of the prettiest fish I have seen. We caught maybe a half dozen fish and took a quick lunch break. We then ran down to two more spots and caught a half dozen more before the water rose. Looking for another great day today guiding Dr David Spivey of Winston-Salem, NC. Hoping for a repeat…. More to come, have a great weekend! Good Morning on the SoHo…. Fri. Sept. 21, 2012….What a morning, felt like fall when we stepped into the SoHo at 715am this morning. 53F, you could see your breath, and feels like Fall…!!!! Great morning guiding Laura Kennerly and we have landed about 25-30 fish, including a pair of fish that were right at 20". Midges, midges, midges….just as it has been during the mornings all month. A few bwo spinners too and a sulphur here and there to round things out. We are headed downriver to another spot…..more to come…! Thurs. Sept. 20, 2012…..We sure had some incredible rains…..voluminous for sure. Many places have been unfishable, the lone exceptions being TN/VA tailwaters and headwater streams pretty high up. All other places are still high but coming down, today and tomorrow representing the first days they have been fishable since the soaking and flooding rains of Monday and Tuesday. Started today on our FFUO Fly Fishing University Online….a future project, Great morning meeting the guys I am working on a future project with, one of which is Shaun Redgate, a client of mine who has done several fly fishing trips. His expertise being working with/designing online curriculums , and we had an idea of creating an online Fly Fishing U. Met with Shaun and his team , two course developers Brian Lambert and Eric Dalton, and web and database developers Steve Horton and Mike Justice. What a great group of guys, will be fun fleshing out this project and seeing it come to fruition. A great group of guys, let the work begin! Also preparing for the SIMMS Ice Out Guide Event for the Spring, and also next year’s fly fishing classes for spring, as well as preparing for a handful of upcoming trips…..the next two Friday and Saturday over on the South Holston. Its been fishing fabulous, expecting more of that. Its a busy time here and our Fall season, traditionally one of our busiest times, is already looking to be as busy as ever. We have a busy end of the week coming up, beginning tomorrow with a guided trip on the South Holston, which has fished incredibly well. I will be guiding Laura Kennerly from Madison, NC, and following that up with a Saturday trip, also on the South Holston, and will be guiding Dr. David Spivey of Winston-Salem, NC. Looking forward to two good days, I expect that we will be midging early, maybe some terrestrials on the banks too, then some bwo spinners, bwos hatching, then a light sulphur flurry, then maybe some spinners before dark. I posted on our Fishing Reports Page a far more detailed example of my personal fishing log, you can check it our here . I posted this to give an idea of what I do day to day in an effort to build a personal database to refer back to when guiding my clients. Having a fishing log is a valuable tool, and is invaluable for getting an idea of what to expect for a fishing trip. Its like a pregame scouting report…and it works. 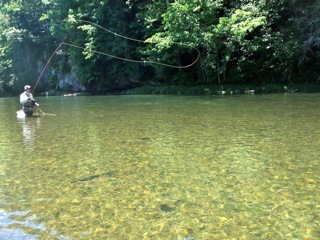 Jeff casting to a rising fish on Tennessee’s South Holston River….Jeff Wayman photo 2012.